This is actually a recipe adapted from one my mother-in-law made back around the holidays. They seemed like such a great idea and were absolutely delicious. She brought her Mexican inspired wraps over all rolled up in Saran wrap and then just sliced them when she got to our house. They traveled great! When she put them out I could not stop eating them. They were so yummy! So when I was invited to a summer pool party a couple weeks back I knew these would be a hit! Me being the tinkerer I am I had to put my own twist on them. I added in the chicken, olives, and cilantro to help bulk up the filling. They were wonderful additions. If you have any parties coming up definitely keep these in mind. 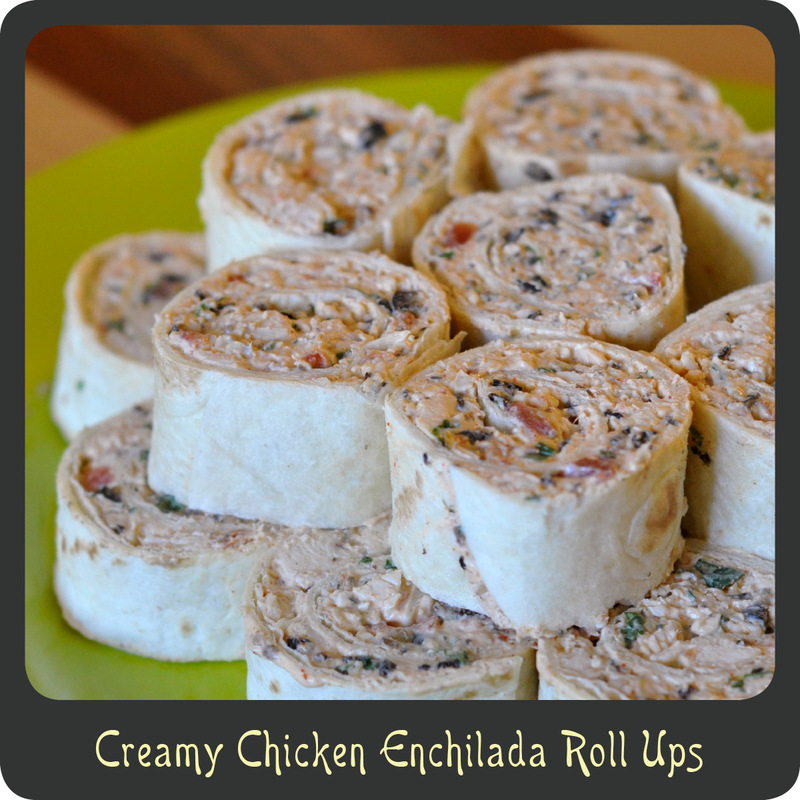 They are relatively easy to assemble and are the perfect finger food for a party of any kind. Note: You can use a couple of tablespoons of my homemade taco seasoning or just part of an envelope of taco seasoning you would pick up at the store. If you like a little heat add in a chopped jalapeño. Using an electric mixer beat together cream cheese, shredded cheese, garlic, and taco seasoning until well blended. Fold in the canned tomatoes, chicken, cilantro, green onions, and chopped olives. Lay a tortilla out flat and place a heaping spoonful of the creamy mixture in the center. Use a rubber spatula and spread an even layer of the filling out to the edges of the tortilla. Roll up the tortilla and as you finish each place on a cutting board or plate. Continue until the filling is gone. Slice the rolls into 1 inch thick pieces and arrange on a plate. what kind of olives are used, it just says olives? I’m not a huge olive fan so I’m wondering if they are necessary, otherwise these sound awesome and I was thinking of bringing them to a work baby shower potluck. I didn’t really love these as is. Not sure what it was. I took the leftover wraps and fried them in a pan with a little butter. Delicious! So creamy! Have you ever made them the night before? I am just wondering how far in advance I can make them and still have them taste fresh? Thanks for the recipe! About how much chicken do you use? Rotisserie chickens can yield up to 3+ cups of chicken–I know it’s variable, but am just curious about what worked best for you. Thanks for a great recipe as summer approaches! I’d say about 3 cups of chicken worked great! Thanks for checking. I hope you enjoy these! Looking for something for an open house, these sound great! About how many did this recipe make? These would be perfect for your event! It all depends on how thick you cut them and how thin you spread out the filling. I cut mine about 1″ thick and got about 40. If you cut them thinner you could get upwards of 80 or so. Do you think it would work with zucchini strips to keep it more low carb? Do you roll these like a burrito and tuck in the ends? I think I’m going to make these ahead and send them with my daughter for school lunch. I’ll probably half the recipe so they’ll all get eaten before they could get soggy. Thanks! I made these for a party recently and they were great! I would recommend leaving the cream cheese out for a bit or using neufchatel since it is a bit softer. I had a hard time folding in the chicken, tomatoes, etc. Thanks! I just made these and they are pretty good! (no olives as most of my friends don’t like olives) Not as savory as I was hoping. A little bland. So I added salt and some cayenne. Better but I’m hoping the flavors will intensify before Saturday morning. 🙂 I will use more tomatoes next time though. That’s the best part. I froze mine before cutting them. Could you add somewhere in the recipe about how many rolls this makes? these are absolutely lovely. thank you for the recipe. yummooo!!!! Can u make these a day ahead and keep refrigerated? I tried these this weekend . It is a great recipe! I would note however to get the biggest tortillas available; and make sure you put the mixture on the tortilla in a very thin layer. Yummy! Once they are cut place them on a cookie sheet top with a sprinkle of your favorite cheese then take them to your holiday pot luck. AWSOME !